By John F. McKenna (McJack): Apparently the anticipated fight between WBC heavyweight champion Vitali Klitschko (43-2, 40 KO’s) and former World Boxing Association (WBA) heavyweight champion David Haye (25-2, 23 KO’s) is one step closer to becoming a reality. A management official from Team Klitschko announced Tuesday that an offer has been made to Haye for a fight early in 2012. Rumors have been circulating for the past week that Haye would be would be making a comeback after his announced retirement on October 13. Haye’s manager and advisor Adam Booth initially squashed the comeback rumors, but “The Hayemaker” confirmed on Monday that talks were underway for a showdown with the elder Klitschko. Haye lost his WBA belt on July 2 when he was soundly defeated by Vitali’s younger brother WBA/IBF/WBO/IBO heavyweight champion Vladimir Klitschko (56-3, 49 KO’s). In that fight “The Hayemaker” fell far short of delivering on his trash talk in which he promised to leave Vladmir “whimpering” on the canvas. To make matters worse Haye repeatedly flopped to the canvas when Vladmir drew close enough to inflict any damage. After the fight Haye blamed an injured pinky toe for his poor performance. At that point even some of “The Hayemaker’s” loyal British support evaporated. After the fight, realizing he had put on a poor performance, Haye attempted to get a rematch with Vladimir but was unsuccessful. It was at that point that Vladimir called out Haye. 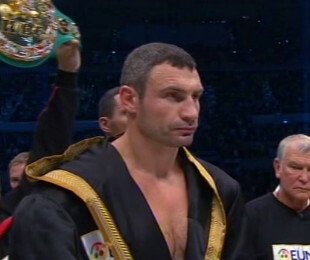 VItali clearly was not amused by Haye’s antics in the lead up to the fight with his brother. “Dr. Ironfist” felt as though Haye brought dishonor to his family. Haye had long stated that it was his intent to retire on his 31st birthday, which was October 13. Vitali again called Haye out at that time in an effort to get him to change his plans to retire. Haye however went ahead with his retirement but left the door open for a comeback against one of the Klitschko’s if the money was right. Many boxing observers give Haye a decent chance to defeat the bigger, slower, less athletic Vitali. “Dr. Ironfist” was disappointed that his younger brother did not KO Haye and wants the opportunity to settle the score once and for all with David Haye. « David Haye vs. Vitali Klitschko: How will this possible fight pan out?